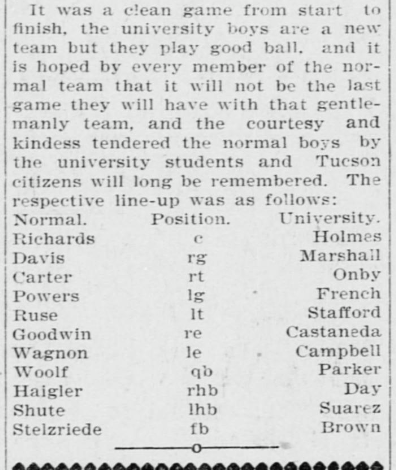 Excerpt from a December 2nd, 1899 Arizona Republican article recapping the first Territorial Cup game. The fabled Territorial Cup game between Arizona State and the University of Arizona is now well underway, marking the 87th such contest between these fierce in-state rivals. When the Territorial Cup was first awarded to the Tempe Normals (predecessors to the present-day Sun Devils) in 1899, the relationship between the Phoenix and Tucson metropolitan areas differed dramatically from that of today – as did the size and stature of their respective colleges. 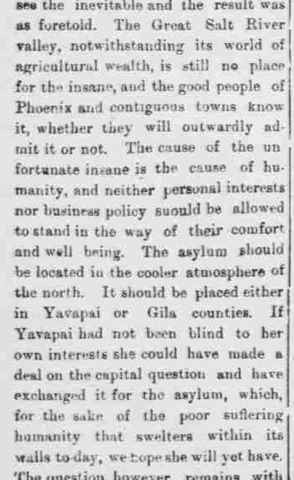 Phoenix proper was home to just 5,500 people in 1899, making its population smaller than the Old Pueblo’s tally of approximately 7,500 residents. Tucson would continue to boast a larger population than the capital city for nearly two more decades, finally surrendering the title of Arizona’s most populous city when eclipsed by Phoenix in the 1920 census. 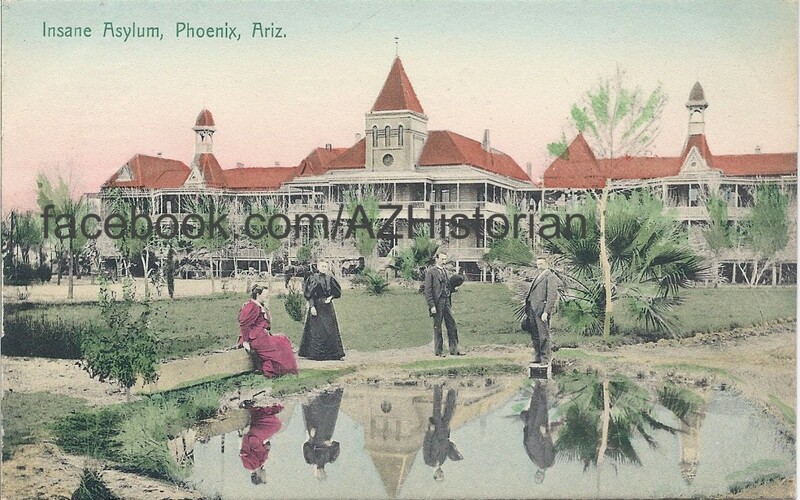 By 1920, the University of Arizona had enjoyed its status as the state’s only university for 35 years, having been awarded to Tucson in 1885 as a consolation prize given in place of the real legislative plum available that year – the state mental hospital, which was placed in Phoenix. Although 1920s Valley residents could proudly tout their state-funded mental facility, the growing community could not lay claim to a university, although their neighbor to the south could do so. What is now Arizona State University was then known as Tempe Normal School, a teacher’s college still decades away from winning university status. With time, Arizonans passed Proposition 200, a 1958 ballot measure granting Arizona State a designation similar to its rival south of the Gila. Notably, the already strong rivalry between the institutions grew more serious when many Tucsonans opposed the effort to elevate the Tempe institution from college to university. Today, the University of Arizona is the academic home of 40,000 students and Arizona State University’s all-campus enrollment has exceeded the 70,000 mark. Phoenix still reigns as the most populous city in the state, claiming a metro population of more than 4.3 million residents while the greater Tucson area is nearing one million inhabitants. Not unlike years past, the two cities and their respective college teams continue to engage in battles both on and off the gridiron. As is often said, as much as things change, they stay the same. As we watch the game tonight, let’s hope that, in words borrowed from a December 2nd, 1899 Arizona Republican article recapping that year’s game, it will be “a clean game from start to finish” with the Wildcats winning praise as a “gentlemanly team” and the Sun Devils engage their rivals with “courtesy and kindness.” While we’re at it, let’s hope that the Tempe team replicates their 1899 victory and keeps the Territorial Cup where it belongs.